Enjoy the rugged beauty and pristine wilderness of Alaska's Emerald Isle alongside the comfort and amenities of home! Our home sleeps up to 6 people and features all new appliances and furnishings. Look outside to see the striking view of a busy ocean channel that feeds the second largest fishing port in the United States! Whether hunting, fishing, sightseeing, or more you will love your stay at our house. Also, if you need a rental vehicle we have two trucks ready for use! The trucks are available during summer month at $75/day. Inquire with owner for availability during your stay. This property is co-owned by 2 married couples who happen to be great friends, the Foremans and the Nussbaums. Stephen and Kelli Foreman have been Kodiak locals for 10 years after growing up in Nebraska. Stephen and Kelli have 2 young boys (2 & 4) that keep them quite busy and entertained:) Stephen works as an educator in the Kodiak Island Borough School District while Kelli works at the Kodiak Baptist Mission. Ted and Kathy Nussbaum brought their young children from Oregon to Kodiak 18 years ago and still feel privileged to call Kodiak home. Ted is an educator with the Kodiak Island Borough School District while Kathy works as a Palliative Care Nurse Practitioner at Providence Kodiak Island Medical Center. We enjoy gill netting for salmon, long-lining for halibut, sport fishing, kayaking, backpacking, hiking, and exploring our beautiful island. We continue to be amazed and blessed to call this place home! It is with much joy that we are able to offer you a great place to stay during your unforgettable Kodiak experience. Come and see! Kodiak is an awe inspiring, untouched treasure. All who visit are taken aback by its breathtaking views and rugged terrain. After 28 years of combined island life we are daily amazed by Kodiak's beauty and opportunity for adventure. After a busy day out playing, the warm, inviting, home atmosphere will be the perfect place to unwind with family and friends. 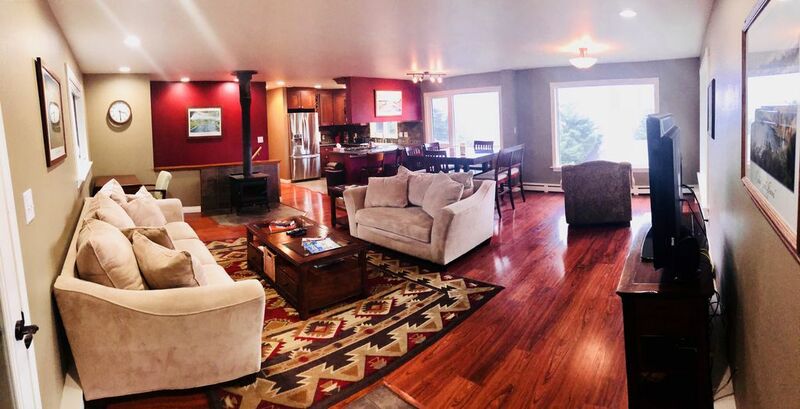 Our home will afford you the opportunity to experience Kodiak how we do, away from a crowded hotel, with an amazing channel view, and for a very reasonable price. Walking distance to downtown. Incredible views of the channel featuring all Kodiak boat traffic! Updated interiors. We also have a large deep freeze for all those fish you're going to catch! There is potential on this property to handle larger groups of up to 12 people. The full property accommodates guests with 5 total bedrooms and 3 baths. Each extra bedroom beyond the pictures you see include working stoves, microwaves, beds, extra deck space, etc...and of course the same striking views of the ocean! Contact the owner to take advantage of a deal for your larger group. Instead of writing a lengthy review I will just say when we go back to Kodiak we will be staying at the "catch" and there is not a finer person to deal with than Stephen Foreman! Clean, bright, and comfortable, with a view of the ocean channel! This house had everything the four of us needed: lots of space to spread out including a spacious entryway to take off our boots and jackets, plenty of amenities, and a great view of the channel. Stephen checked with us our first day to make sure everything was OK, which we thought was a nice personal touch. Bald eagles were soaring by the living room window (close!) every day. And his truck came in very handy, as we drove the entire length of the Kodiak road system! We highly recommend this place! Our stay at The Catch was fantastic .More than enough room for the six of us,with a great location on Kodiak.Will most defiantly go back in the future!! Perfect base camp for exploring Kodiak. My group of fishing buddies made this our base camp for several excursions around Kodiak. The house was a nice, clean, comfortable, and well appointed place to relax in the evenings and enjoy the great view. I plan to bring my wife and daughters to Kodiak and will definitely be staying here again. Owners were very helpful in assisting me with planning out our trip as well. This is our first review of the Catch. We have been there 2 years in a row and already planning on next year. The house is located on the main road in town. That's not a problem, but a plus. Most everything you're looking for except fishing is located in town. We were a group of four adults and we thoroughly enjoy the comforts this home provides us while on our fishing vacation. The pictures are very accurate, and the owners are excellent to work with. The mud room is great tool for us fisherman with gear. We have grown quite comfortable with the Catch and highly recommend the house. This is a fantastic house with a great view in Kodiak. We would highly recommend. From our location you are within 1 mile of anything the town has to offer! Drive another mile and you can experience anything the wilderness has to offer. Don't miss our amazing visitor center, museums, and charter services for hunting and fishing!